Award-winning thriller author Wendy Corsi Staub debuts the first in a new Foundling series with Little Girl Lost. 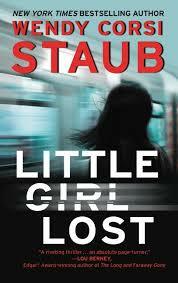 Staub’s latest, Little Girl Lost, is the first book in her new Foundlings trilogy, where lives become intertwined and secrets are kept. It’s the pre-dawn hours of May 12, 1968, a Mother’s Day Calvin Crenshaw won’t soon forget. As janitor at Harlem’s Park Baptist Church, his work is interrupted by a whimpering sound coming from the choir stall. He finds a baby there, wrapped in a small bundle. Having been unable to conceive a child with his wife, he makes the fateful decision to claim the infant girl as their own. Elsewhere in New York City, an elusive serial killer known as the Brooklyn Butcher has been slaughtering families in their beds, leaving one young female survivor at each scene. These seemingly disparate events are anything but that, under Staub’s skilled thriller writing. Flash-forward to March 7, 1987 when college student Amelia Crenshaw makes the shocking discovery that she is a “foundling”—somebody that was abandoned by his or her birth parents to be discovered and cared for by another—as her mother lays dying of cancer in a hospital bed. Both shocked and griefstricken, she vows to unlock the secrets of a past she never suspected she had—despite her father’s refusal to discuss the details of her supposed adoption. NYPD Detective Stockton Barnes is grieving, too. He’s shown up in earlier novels, but now as his mentor and surrogate father wastes away, he receives a legal notice that a one-night stand he had is now pregnant with his child. Barnes uses a new case to distract him: the disappearance of millionaire Perry Archibald Wayland III, whose supposed suicide may have been staged. How Amelia and Barnes search for individual answers intersect bring them to a killing spree that harkens back to the Brooklyn Butcher. Staub’s characterizations are vivid, with Amelia and Barnes providing the counter views of a youn girl who’s the product of an unwanted pregnancy, contrasted with Barnes being the cause of one. This emotional weight resonates with the reader. Staub uses the backdrop of 1980s New York City to life through her depiction of landmarks and locales, as well as references to pop culture and politics. It’s a subtle thing but one that hints at the depth of her research—and that elevates the story. Filled with twists and turns, Little Girl Lost is a suspense story that will leave readers looking for the next installment.